Putting on an event or just want to brighten up the office wall. 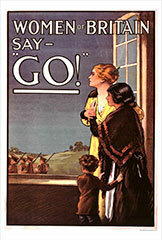 A great selection of reproduction First World War posters. A patriotic call to join-up. 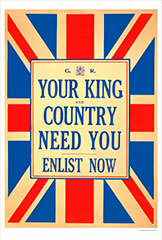 This union flag background and an appeal from the King does its best to persuade you to enlist. 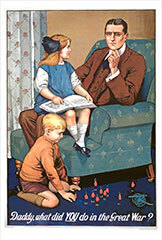 FWW004 Daddy what did you do in the great war? 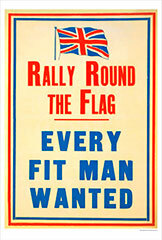 A famous recruitment poster for the great war. 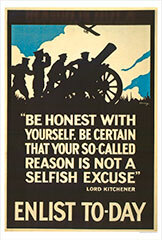 A wonderful image and a quote from Lord Kitchiner tries to persuade you to enlist. 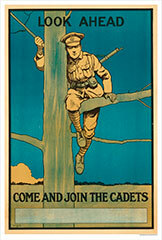 A recruitment poster for cadets with an excellent image and space for writing the local address to attend.